Le Blog What can a skin therapist do that I can’t do at home..? What can a skin therapist do that I can’t do at home..? There are professional products I can buy and use on myself, Yes? Have you ever thought this? Sure, a simple exfoliation and masque routine is excellent for you to do at home, but if you want REAL RESULTS , you can’t go past an experienced skin therapist and some professional strength products. And these are DEFINITELY not to be messed with at home or without the proper training. Just like a brunette who’s thought she could ‘go blonde’ at home and ends up with bright orange hair, experimenting with incorrect or professional strength products on your skin at home can lead to all sorts of skin problems. Your skin is the largest organ on your body, it’s the first thing people see when they look at you, it can make you look and feel like your youngest, healthiest self if looked after properly or it can really age you if you don’t choose to invest some time and effort into your skin. At GLO Skin Body , our therapists have extensive Dermalogica training and years of experience and they can help you achieve your best skin ever with the use of Advanced Skin Treatments. Our newest Advanced Skin Treatment uses Dermalogica’s IonActive System . The IonActiveTM Power Treatment is a 45-minute professional skin treatment designed to address skin conditions such as acne, dehydration, sensitivity and skin ageing. Using potent, professional only formulas that can be optimised with the latest treatment room technology, the IonActiveTM Power Treatment achieves visible, supercharged skin results with no downtime . The results being achieved are nothing short of inspiring! The IonActiveTM Power Treatment delivers immediate, noticeable results after just one treatment. For maximum results a series of three to six treatments every two to four weeks is recommended, followed by maintenance treatments twice per year. By combining Advanced Skin Treatments with a customised at-home skin care regimen, you will see results far and above what you would with simply one or the other. When you book in with us for an Advanced Skin Treatment you can be confident that the products being used on your skin during the treatment are significantly more advanced than your home care products and also that your therapist is highly trained and skilled at reading your skin to help you achieve your best results. 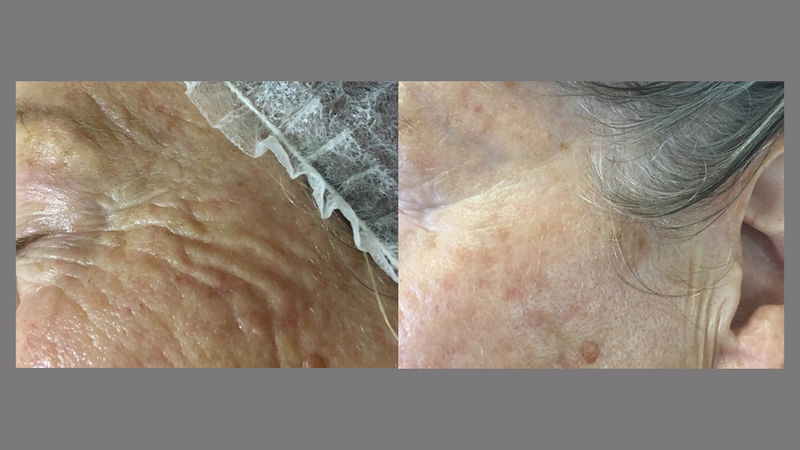 Combine this treatment with an at home skincare regimen that has been specifically prescribed for you and see for yourself the results you can achieve! Keep reading for more details on IonActives and other key ingredients. The IonActiveTM Power Treatment draws from up to six professional formulas: four IonActives , each one developed to target a specific skin concern, and two Gelloids with skin-specific benefits that can be layered over the IonActives to seal in active ingredients. The professional skin therapist performing the IonActiveTM Power Treatment will assess which combination is ideal for your skin, based on our initial Face Mapping skin analysis and consultation. ● Retinol 1% IonActive contains microencapsulated retinol to reduce visible signs of skin ageing, improve skin texture and the appearance of wrinkles . Microencapsulated Chlorella Extract contains the same proteins and amino acids found in dermal fibres, increasing collagen synthesis and improving skin firmness. ● Hyaluronic Acid IonActive relieves dehydrated and/or sensitised skin with microencapsulated Na2 Acetyl Glucosamine Phosphate , a building block of Hyaluronic Acid, which aids in cell regeneration and skin hydration. Varying molecule sizes in this IonActive hydrate top layers of the skin, protect against external irritants such as air pollutants, and bind water into deeper layers of the epidermis. ● Oligopeptide IonActive treats hyperpigmentation. Microencapsulated Diglucosyl Gallic Acid , also known as TriHydroxy Benzoic Acid Alpha Glucoside (THBG), is activated by natural microflora in the upper layers of the stratum corneum and is then converted to TriHydroxy Benzoic Acid (THBA), an anti-inflammatory agent that has four times the antioxidant power of Vitamin C. Together, they help control melanogenesis, reduce pigmentation spots, and inhibit skin redness. This IonActive also contains Oligopeptides 34 and 51 , which have been shown to significantly reduce melanin production and brighten skin. ● Niacinamide IonActive controls and prevents adult acne . Microencapsulated Potassium Azeloyl Diglycinate , a stable derivative of Azelaic Acid, inhibits the growth of bacteria, decreases the formation of clogged pores and reduces swelling and inflammation by scavenging toxins and free radicals in the skin. Colloidal Silver and Tea Tree Extract act as antibacterial agents and Japanese Knotweed helps control sebum production. ● ExoThermal Gelloid is a thermal, self-heating formula that instantly warms with the natural heat of human hands. This formula can be optimised with use of Red LED, warm stones, warm peltier, Indirect High Frequency, and manual massage and is ideal for stressed, ageing or dehydrated skin. ● EndoThermal Gelloid offers a cooling sensation while providing antioxidant protection against photo damage. This formula can be optimised with use of Blue LED, or cold stones, globes, or ]roller to reduce inflammation, suppress acne, and soothe sensitised skin. to book your free initial skin consultation now.